The Liaison Collaborative opens officially this afternoon at 3pm SLT so I can put this out there now. For this month I kind of did a revamp. I’ve made things similar to this a few times in the past but I haven’t had anything in store inventory for quite awhile. Heartsy dancing spot. This one is a little nicer. 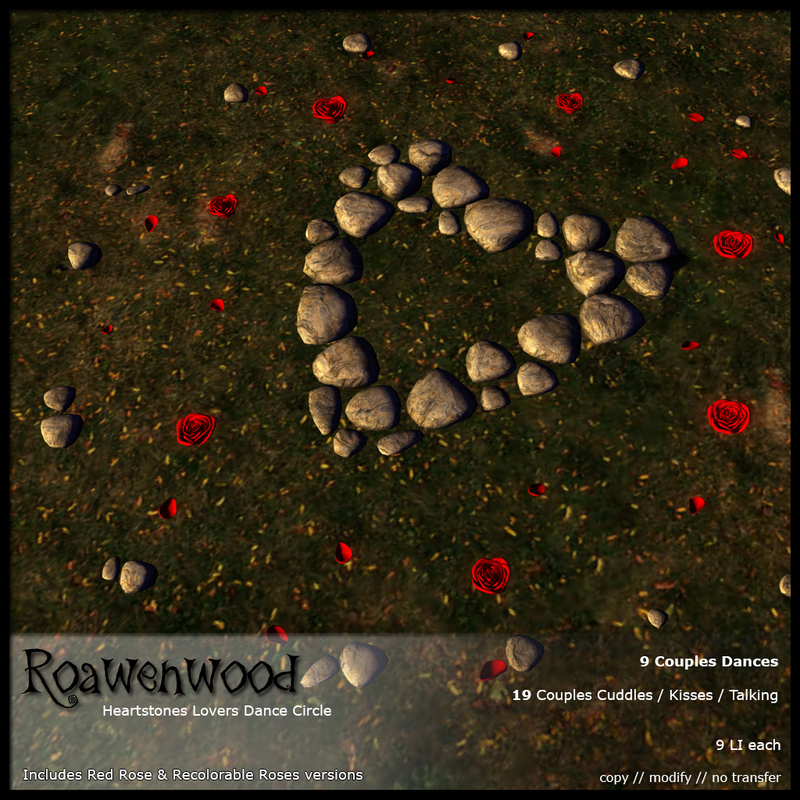 Has roses, stone circles, rose petals. I mean, sure it’s not fancy fancy but you put this down somewhere you have an instant romantic spot waiting for you. I’m actually considering adding the proposal animations I have in it. Because it would really fit into it awesomely but I wasn’t going to diddle with that right now. Time and all, needed to get done. You know how it is. Hmm, you know it could be used for outdoor weddings too. If I added the ceremony animations. Anyhow… I digress and ramble. 9 Couples dances. Most of them are slow swaying sorts of things where you’re nestled in with your lover or friend for awhile. A couple of them are faster. A bit more fun. 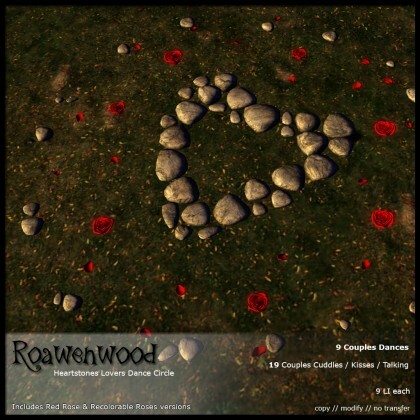 19 couples kisses, cuddles, and just talking sorts of animations. To let you in on a little secret I put the talking ones in there partly because it just seems so abrupt to insta-sit on something and be in each others arms. Where’s the build up?! Where’s the romance? And ffs what if it’s one you don’t like right? Or a little more intimate that you wanted with THIS particular person. Talk about awkward. Jump on something.. “oh yea right, I wanted to sit with you but you know, that might be a bit more than what I was looking for” while the animation set has you dipped and his lips locked to yours. Uhhuh, so yea that’s why I do that. So you can comfortably shuffle through the animations, find something and then sit nice. So along with the options to be all snuggle like I made two versions available. One is the red roses version. The other has the roses and petals left at their default white so you can edit and recolor them to whatever you might have in mind. Just make sure to edit linked parts, click on the ones you want to recolor and then use the color part in the texture window to play. Voila! And only at the Liaison Collaborative, after February it will be in the main store.